The above video is a showing of a number of upcoming titles for the Nintendo Wii. What we are most concerned about occurs at roughly 1:25 into the video. 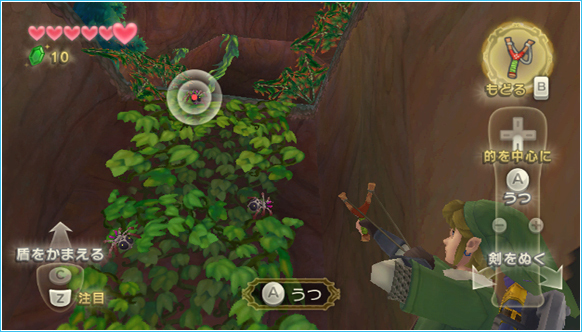 There are a series of short clips from Skyward Sword, where it shows Link using the Beetle, fighting a moblin, deflecting an attack from an Octorok, rolling around in a fire like dungeon, and then fighting a stalfos. Most of this material is not new at all, but there are several key points I wanted to point out. Number one is that we now have another enemy to add to the known enemies thus far in the game, the Fire Keese. 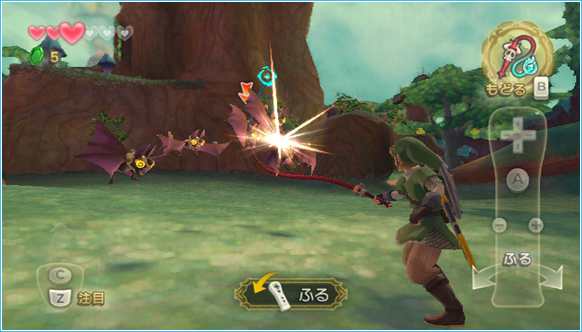 As you can see in this picture, the Fire Keese enemy makes its reappearance in Skyward Sword. It can be presumed that it will carry much of the same traits as it did in its previous incarnations, including the possibility of burning some of Link’s wooden objects. With the addition of the Fire Keese, this will likely mean that other variants of the Keese, such as the Ice Keese will also make an appearance. 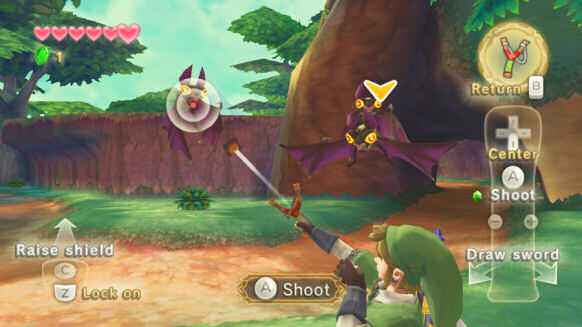 Thus, several familiar foes are very likely to appear as Skyward Sword Enemies. This screenshot, as well as the short clip in the video, sheds more light on this fire like dungeon that appeared briefly in the initial E3 Trailer. This screenshot does show what looks like a second floor, and what I make out as a door in the distance, which leads me to believe this is in fact a dungeon. 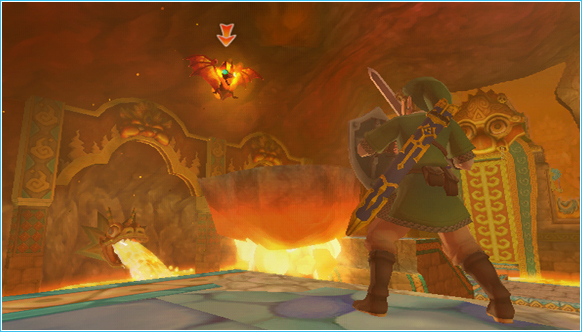 If it is in fact a Fire Temple of sorts, this could mean that the similar element-like dungeons, such as Forest, Water, and Desert, from previous Zelda titles will make an appearance in Skyward Sword. Perhaps it is just an elaborate cave inside Death Mountain or whatnot, but we can only speculate as of now. A side by side comparison with the new screenshots to the E3 screenshots, will show that there have been some hard to notice, yet big changes from the Skyward Sword that we saw at E3. There are two screenshots shown below, the first is from E3, while the second one is from yesterday’s Nintendo Conference. Right away you can notice that the brightness of Link has dramatically changed. His face no longer shines as it did in the E3 version and overall it seems that the Cell-Shading has been toned down greatly. Furthermore, the new screenshots seem to show a world that is a tad bit darker than what we saw during E3. 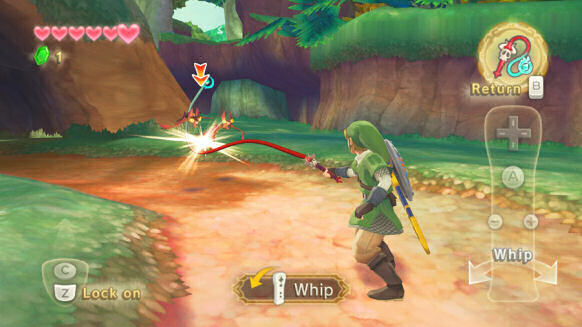 Below is another side by side comparison of Link using the Whip. The color of Link’s clothing, as well as Link’s whip seem much darker now, and it seems like there is a conscious move to go away from the over-the-top colorful brightness that we saw in the E3 version. You can tell the color tone has changed by just looking at Link’s face, as you clearly can notice the darker look of him, especially in the previous set of screenshots. 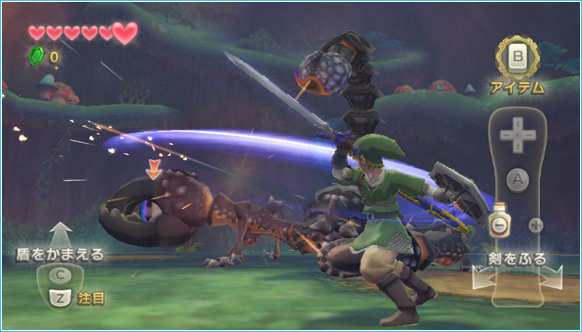 We have another side by side comparison, this time showcasing Link fighting the scorpion like boss. Much of the same as the above images, Link’s color has been toned down just a tidbit. You get a good luck at Link’s clothing, you can see the obvious differences within his tunics color and the brightness it gives off. 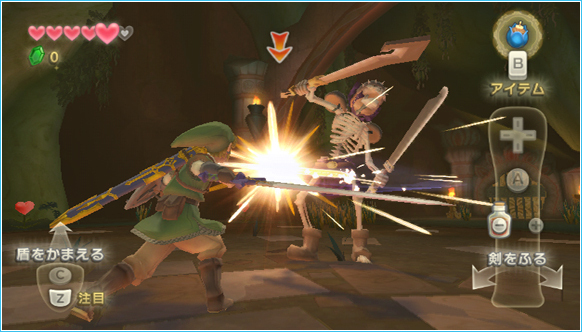 We have one more side-by-side comparison, and this one is showcasing Link fighting the Stalfos. So there we have it. 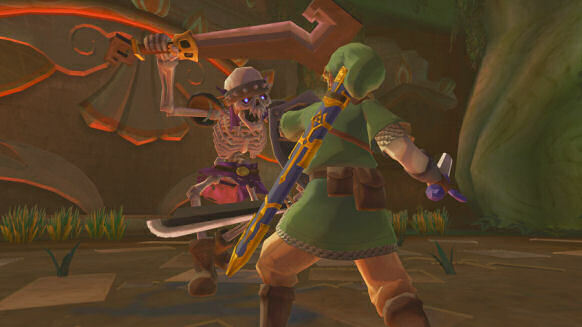 A short clip and five new screenshots from Skyward Sword. Perhaps the screenshots were just taken at a lower resolution and thus, the quality was diminished a bit and this led to the over-analysis that you see in this post. Who knows really, but in my opinion, this will be the last time we see anything relatively new from Skyward Sword in a long while. With Skyward Sword not set to ship until 2011, I think Nintendo will be hush about it, as they want to promote their holiday 2010 lineup and then the Nintendo 3DS early next year. We still have no release date set for Skyward Sword, yet we already have a release date for the Nintendo 3DS, and even Ocarina of Time 3DS with a ‘Spring 2011’ release. I personally think that this means that there is no chance Skyward Sword releases anytime before the 3DS, and we are likely looking at an April or May 2011 release at the earliest. Then again, I could be wrong, but that is my take on it. Be sure to stay tuned right here at Zelda Dungeon where we will continue to provide the latest Skyward Sword news and updates. 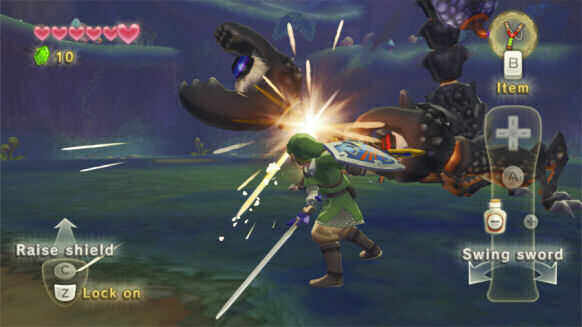 Remember to bookmark our Skyward Sword Walkthrough, which we will be providing once the game hits shelves in 2011.